The above info came from patricia, and was edited by yours truly (contact me). 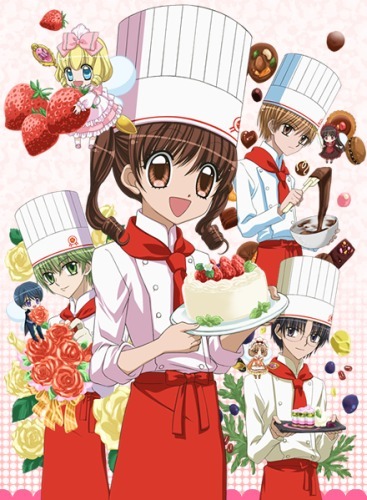 Yumeiro Patissier is about a 14 year old girl named Ichigo, a clumsy girl who had no dreams until she went to a chocolate festival. She loves cakes so she grabbed a bunch and eats one of them and it's familiar to her, like her grandma made it. So she was looking for the table where she grabbed it and a guy name Henri asked "What's wrong with my cake". Ichigo says "Well my grandma made it. It seems so familiar to hers". Then they started to talk about Ichigo's grandma. Finally Henri asks Ichigo "Will you go to St. Marie Academy with me in Paris?". "Yes," she said, "'cause it's my dream to be a pâtisserie," she thought. She draws closer to fulfilling her dream of becoming a pastry chef when she enrolls in the St. Mary Academy culinary school and meets a tiny "spirit of sweets." She meets three handsome boys who are great at cooking. The above description came from patricia, and was edited by yours truly (contact me).